Reintjes is a name known well in maritime circles, a German engineering and manufacturing company which has designed and built some of the most rugged gearboxes on the waterways. Klaus Deleroi took the helm at Reintjes in January 2015, and he is in the midst of steering a change in mindset at the company: a mindset that is more customer-centric to better understand and fulfill the needs of the people and companies that own and operate vessels. We met with Deleroi in his Hameln, Germany, HQ for insights on the path ahead. 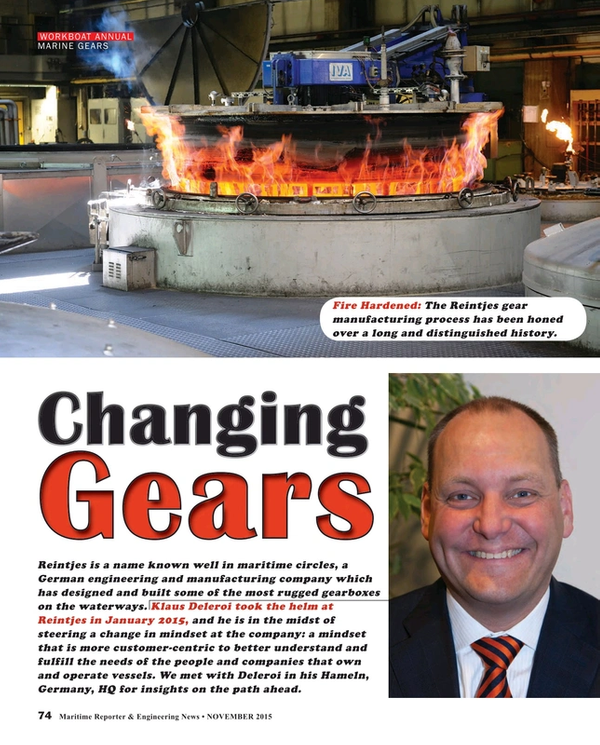 When Klaus Deleroi decided to switch gears on his career, leaving a life time of selling engines – first for MTU for 14 years including five years heading sales in Asia, and then for MAN Diesel & Turbo as the global head of four-stroke engine sales – the decision to take the helm of Reintjes simply felt right. From the outset he liked the approach from the company, as his predecessor at the helm of Reintjes first came to him a full 30 months in advance of his retirement to gauge Deleroi’s interest in running the company. Next he appreciated that Reintjes, as a trust-owned company, has the luxury of making decisions and business plans with the long-term in mind, not beholden to the oft fickle masses that can drive public companies. Finally, an entrepreneur at heart, Deleroi saw Reintjes as a challenge. While long-holding the dream of owning and running his own company, he viewed the Reintjes top post as an opportunity to meld his outgoing, people-first business principles with the exceptional engineering and manufacturing pedigree of Reintjes, ultimately aiming to make the company a more dominant player in the global maritime market while expanding its horizons into industrial applications. But Deleroi is quick to admit that his first inclination on taking the top seat was wrong. Deleroi is well versed in German excellence in engineering, and he knows the quality of product is the rule to survive long-term in the rigorous maritime environment. But he also believes that producing a great product is simply not enough, particularly in the modern maritime world. His vision of Reintjes extends far beyond the factory floor, as he sees the company evolving to become a true knowledge partner on all matters maritime propulsion. His mission is to get the entire organization, top to bottom, moving forward with a unified understanding of the customer – an understanding their business, of the particular ways in which they operate their vessels, and of their needs. “The customer is front and center, always,” Deleroi said. Just prior to our arrival Reintjes has completed its global sales and marketing summit, gathering sales and service personnel and distributors from around the globe for three days of intensive meetings and team bonding. From this emerged the skeleton of what Deleroi envisions as a long-term plan forward. Playing the role of power train expert is particularly topical in today’s maritime industry, as owners are under consistent pressure to meet ever stricter emissions targets. While the main focus has been on primary power plant and fuel, Deleroi said the changes can impact the entire power train. “The ratings and set up of the gearbox can be a bit different,” said Deleroi. As the power range of the engine is changing, the speed is changing too, sometimes requiring different gearbox ratios. Also when the engine makers change their combustion, the momentum curve is changing too, meaning that consideration must be given to the gearbox too, to ensure most efficient operation. When asked about the indicators monitored by Reintjes to accurately assess the future direction of its business, Deleroi’s answer was a bit ominous: the price of oil and activity in China. “Of course one indicator is the oil price, which is a big indicator for the offshore oil industry. When the oil price goes below $70 per barrel,” offshore oil and gas drilling activities tend to dry up. • Fishing Business: The fishing fleet around the world is very old and is in need of being rebuilt and renovated. • Military & Government business: As the world is increasingly in conflict, more countries are investing in patrol boats, frigates and corvettes. • The Fortjes podded package, a space-saving design with a hybrid option available. • A Hybrid Gearbox which is ideal for slow-speed operations, and electric drives to promote smooth running, low noise and low energy consumption. • Dredging Gearboxes developed specifically to handle the rigors of dredging, including on pumps installed inside the vessel and dredge pumps in use under water.